The winning entries of the “One Page Dungeon” contest have been announced. A D20 is nothing special. But a D20 Soap on a Rope is. Hey folks, on a request by Elidis, I'll try to show you how the various Earthdawn versions in different countries and in different languages look like and what the publishing companies are about. So I'll start with the hardest one. I completely don't know what the Japanese Earthdawn scene is about, but I would say they have a "different" view on the Earthdawn universe. Thank god that they didn't make some kind of weird Earthdawn manga out of it. Most of the web resource or webpages are down or not up to date, but there was or is a scene of fans that had long discussions about Earthdawn. If anyone knows what is going on there please contact me or leave a comment. 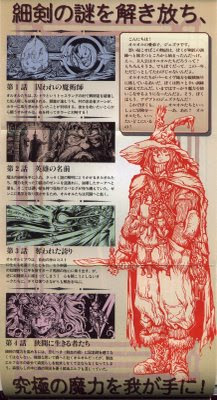 The japanese Earthdawn edition, called ASUDON was translated by Megumi Tsuge for the SNE Group, which is or was one of the pioneers for roleplaying material in Japan. 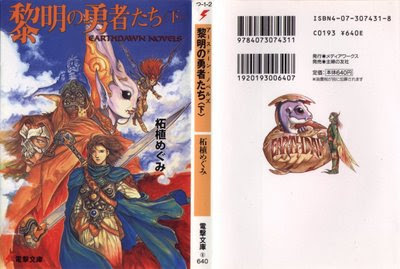 Earthdawn was published 1997 by Mediawakusu or Media Works Inc. in Japan. It's a pity but I wasn't able to discover some pics of the Japanese rulebooks or something else of the japanese version except the novel covers beneath. Some weeks ago I discovered a working Japanese Earthdawn page….. and I immediately left a comment to get in touch with the author of the さり海馬 blog. The author is Thalion and he provided some information about Earthdawn in Japan. Right now there is a limited number of old fans who play Earthdawn in Japan. So, unfortunately it seems that Earthdawn is dying in Japan. Thalion told me that mostly D&D4e Japanese Edition has a rather big scene in Japan. Aasudoon ruuru bukku (Earthdawn Core rulesbook, pic above), Misuto obu bitoreiyaru (Mists of Betrayal), SHATAADO pattaan (Shattered Pattern), Baaseivu aasudoon waarudo gaido (Barsaive: Earthdawn World Guide, an edited book based on the Barsaive Box Set) and below you see the novel “Reimei no Yuusha Tachi” “Braves of the Dawn” 黎明の勇者たち (Japanese original author: Tsuge Megumi). The last title is one of two novels, that were only published in Japan. I don't know what the title of the second one is. The second novel that has been translated to Japanese seems to be Talisman, but I don’t know if the picture below is the actual cover of the talisman novel. By the way I guess the title of the first novel is completely wrong translated (google translation of the japanese page). 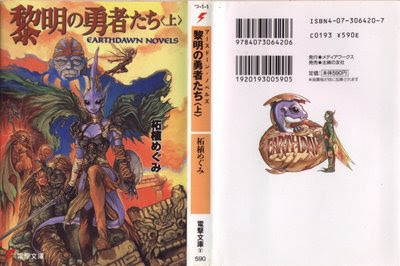 Dammi is the only person I know who owns those rare Japanese Earthdawn novels. He said that these are the most exotic collectibles he owns. Enviable! He also told me that the books are read from back to front like most manga comics, that's why the covers are the wrong way round. If you look at the covers the T'skrang is one of the most differing characters compared to the "western" Earthdawn interpretations. I think it's a good way to get another view on the descriptions of the different races in Earthdawn. 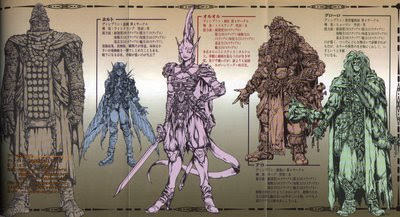 I like what they did, also the paintings of the other characters shown above and thank god again that they didn't make some huge-eyed manga crap out of Earthdawn in Japan. I hope you enjoyed the short excursion into the the Japanese Earthdawn world. Big thanks go to Elidis who inspired me to make this post and supported me with the pics. And after the update I also thank Thalion. Hope he keeps the flag up for Earthdawn in Japan. Next country will be was Poland and the community over there, maybe someone could support me with some pics or info's of the polish Earthdawn books. I just read on the Earthdawn.com forum that Drucifer released the second issue of his fan work “Tableau Infractus”. I didn’t expect to see the second edition of his fan series that soon, only one month after the first issue was released. Great stuff Drucifer. Recently Dammi put a video interview online at his blog that was held with DORP-TV. Unfortunately the interview was held in German, I mean unfortunately for the non German speaking community. I mean the rest……the others…….. I mean…….ok. So I decided to sub the video to let you all know what Dammi had to say. Enjoy.